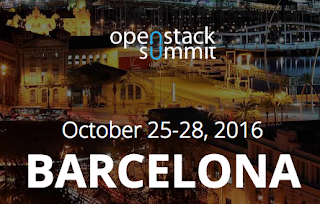 As previously posted, I presented a session at the OpenStack Summit in Barcelona. The session was a recorded brown bag talk, told on on Wednesday, 26 Oct 2016 at 16:00 - 16:15. At the time I am presenting any session I try to have the slides posted online so that attendees can obtain them right after I finish. Below you find the link to the talk with my slides and the published video recording of the session. The talk was a very short time slot with no chance for Q&A, so I included links to the materials I covered at the end and links to videos instead of live demos. There's just not enough time to demo both a Cloud Deployment Planner and a QuickStart Cloud Installer in 10 minutes or less. Look for the hashtag #vBrownBag for more around the social networks during OpenStack Summit in Barcelona.